To the words of the weigh-in announcer, the mega fight is all about one seeking redemption and the other trying to erase doubts. 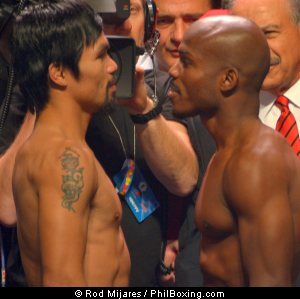 Both Manny Pacquiao and Timothy Bradley came in at 145 pounds good to go for an exciting bout on Saturday, April 12, 2014. The weigh-in ceremony was graced by Irish Micky Ward who fought three consecutive fights against boxing great Arturo Gatti, won the first one but lost the last two in 2002 and 2003. Also, in attendance is Nevada’s next Attorney-General Ross Miller who came in to support the fight. Pacquiao entered to a rousing welcome from the crowd who stood up in jubilation to get a glimpse of the Filipino boxing icon. Bradley entered the stage with his hand on his ear clamoring for the crowd to give more noise to his presence and did not stop waving his hands for more until he was fully satisfied. The pro-Manny fans dominated the crowd in attendance and were not hesitant to jeer Bradley and chanting “Manny” from time to time. Bradley’s fans chanted his name, as well, and this precipitated a war of chants between the pro-Bradley and the pro-Manny in attendance. Fans erupted when Pacquiao was introduced by ring announcer “Let’s Get Ready to Rumble" Michael Buffer as the 8th time and 8th division world champion and the pride of the Philippines for the official weigh-in. “145 pounds. The Pacman. Manny Pacquiao.” And the crowd kept on booing when Bradley was being introduced. “145 and ½ pounds for the defending world champion,” Buffer announced. “He is great, he is experienced and he is ready,” Bradley said in response to HBO announcer, Max Kellerman’s question. “It is business first,” Pacquiao said when asked by HBO announcer, Max Kellerman, how much compassion one is expected from Pacquiao. That response generated more noise that drown Pacquiao’s additional response. The officials are Kenny Bayless as the third man in the ring and the judges are Michael Pernick, a Florida Boxing Hall of Fame Class of 2013 Inductee, whose last fight was between Zsolt Erdei and Shalva Jomardashvili for the WBO European Light Heavyweight title. Glenn Trowbridge from Nevada whose last fight was between Leo Sta. Cruz and Christian Mijares for the WBC Super Bantamweight Title and Craig Metcalfe from Alberta, Canada whose last fight was between Saul Alvarez and Alfredo Angulo. All three made their last appearance as judges on March 8, 2014. Pacquiao vs. Bradley 2 is promoted by Top Rank Promotions in association with MP Promotions Tecate and Playstation 4 and will telecast live on HBO pay-per-view beginning at 9:00 p.m. ET/6:00 p.m. PT. Rod Mijares also writes for “Balita” based in Glendale, California.